The Barbet have had their initial breed report released based on 49 Barbet tested around the world. Welcome Barbet breeders to breed conservation! The Barbet is an ancient breed that was a part of the foundation of many other breeds worldwide. Like many breeds, numbers dwindled around the time of World War II, and the breed was restored after that time. Today, numbers are low worldwide, though growing, with many devoted breeders dedicated to its preservation. What has UC Davis and esteemed Dr. Niels Pedersen DVM PhD found in regards to the breed? You can find the full report here. 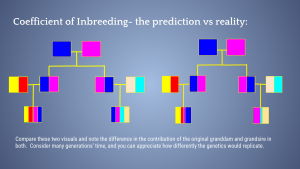 Inbreeding – how genetically similar are the parents of typical Barbet? The entire population is on average slightly outbred with a mean IR score of -0.070 (Table 4, Fig. 4). Nonetheless, the population contains a small number of dogs that are products of highly related parents. One half of the dogs had IR values from -0.081 to +0.207 and one fourth from -0.025 to +0.207. Therefore, some of these inbred dogs had IR scores as high as +0.207, near the level of offspring of full sibling parents. This group of more inbred dogs is balanced by a similar percentage of the population of outbred dogs with IR scores as low as -0.121 to -0.316. This is one of the most outbred groups of pure breed dogs that VGL has observed. Interpretation? Barbet have been breeding for the most part randomly, meaning there is no breed specific bottleneck and single lines favored by the majority, with very small percentage of the population inbreeding at high levels. This may change as more of the population is sampled, but in this first sample, Barbets are selecting mates that are unrelated from one another. However, being heterozygous, or outbred, is not an indication of diversity of the breed. Biodiversity and allelic richness are terms we try to discuss regularly at BetterBred. Namely, how many different versions of genes or alleles exist in each breed? Breeds with more allelic richness and whose genetics are also well distributed throughout the population tend to be healthier. So what did they find about the Barbet population? 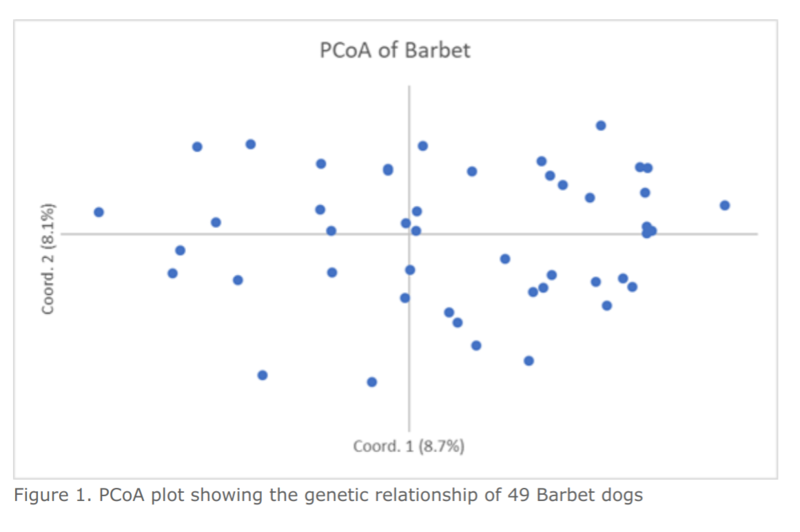 One of the first things you can notice is that Barbet form a single breed with none found clustering within the breed, as seen by the PCoA graph above (figure 1 above). Dr. Pedersen writes, “individuals are not tightly clustered around the central X/Y axis but are spread at some distance from each other across the graph. 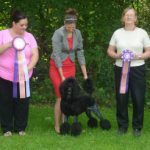 This is another indication that these 49 dogs were genetically diverse.” When the PCoA is made to include several breeds, you see that they cluster closely with Standard Poodles. It will be interesting to see how other water dogs cluster in relation to the Standard Poodle and Barbet, once they are tested. But what about biodiversity or allelic richness? 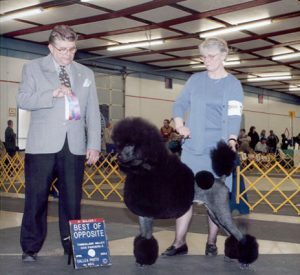 Barbet have low diversity in comparison to other tested breeds, but not the lowest of breeds tested to date. Breeds with lower biodiversity include Alaskan Klee Kai, Swedish Vallhund and Shiloh Shepherds. However, as more are tested it is likely more biodiversity will be found. Average alleles per locus and effective alleles per locus are aspects that we discuss in these breed reports. 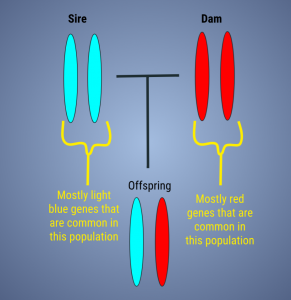 The closer the effective alleles (we call these “alleles that are effectively contributing to your population”) are to the average alleles per locus, the better distributed the genetics in the breed are. 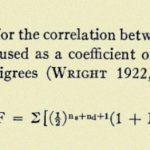 Why would you want well distributed genetics? It keeps risk of unwanted recessive traits from appearing, lowers risk of random loss of diversity (called genetic drift) and it lowers the frequency of both simple and complex disease haplotypes that might unintentionally become more common if there were a bottleneck. The average alleles per locus in this breed was found to be 5.573, while the effective alleles per locus was found to be 3.573. What does this mean? 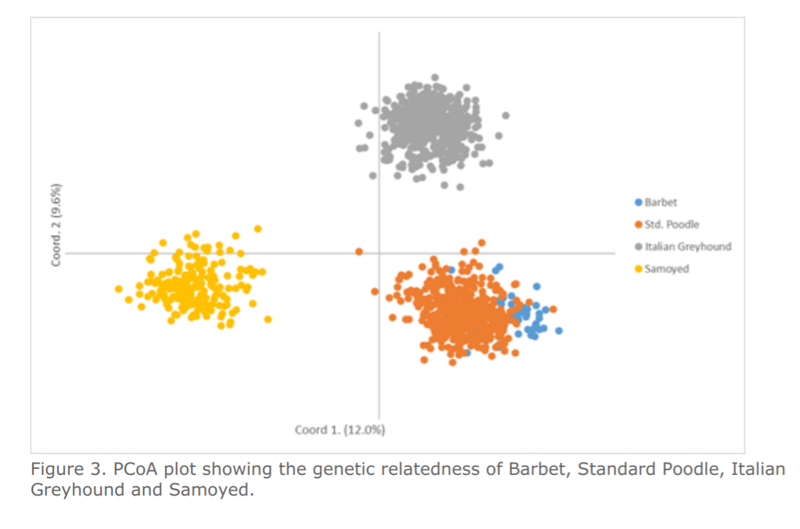 The effective alleles are closer to the average alleles per locus than is typical for most breeds, meaning – in this tested sample – the Barbet is doing a good job maintaining what they have. Each breed should make an effort to raise their effective alleles per locus. How do you do this? You use BetterBred’s breed management software to breed for higher than breed average Outlier Index (OI). This measurement was created to help breed communities maintain healthy distribution of breed genetics or redistribute unbalanced diversity, even while they select for the traits they want in their dogs. Dr. Pedersen’s hallmark comparison is to a combined population of village dogs. These domestic dogs have not been shaped by human effort, but instead have evolved through random breeding and natural selection. They therefore have a great amount of genetic diversity which is representative of the original diversity dogs had prior to modern breeding methods which changed them. 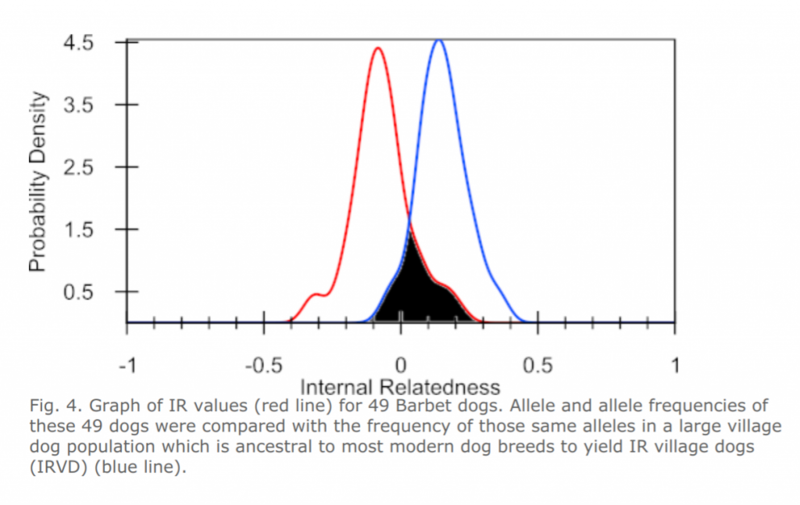 Dr Pedersen therefore assesses the IR results based on only their own genetic data and compares them to their results using the village dog genetics – called IRVD. The difference between these two results illustrates the diversity that has been lost in each modern breed. The IRVD curve for Barbets was shifted well to the right, reflecting a 77.8% loss (or 22.2% retention) of potential genetic diversity during breed development (Fig. 4, Table 4). Translation? Barbet have lost a significant amount of biodiversity in comparison to the other tested breeds to date. However, this may change as more of the breed is sampled worldwide. A Look at the Dog’s Immune System! 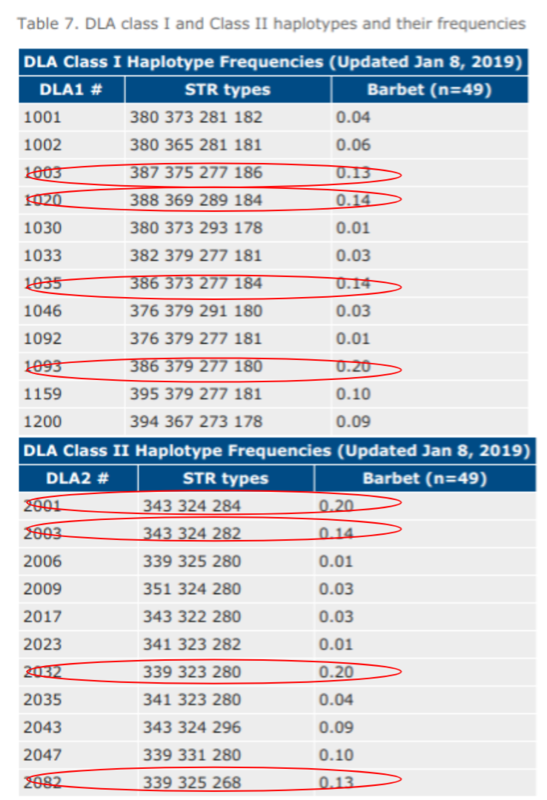 Considering that only 49 Barbet have been tested to date, there have been a relatively large amount of DLA haplotypes found in this population with 11 DLA class I and 11 DLA class II haplotypes discovered. Breeders should take note of the atypical DLA haplotypes in the population so as not to lose them to genetic drift. You can read more about using DLA in a breeding program here. DLA class I and II haplotypes found in the 49 Barbets tested were extensively shared with other breeds, however one DLA class I haplotype; namely 1200, has not been identified in other breeds to date (Table 8). Strong DLA class I and II haplotype sharing occurs with the Standard Poodle (8/12 DLA class I and 6/11 class II haplotypes). Somewhat less extensive class I and II haplotype sharing was also observed between the Barbet and Miniature Poodle, Golden Retriever, Havanese, and Italian Greyhound, all European breeds. Little haplotype sharing was observed with more Asian breeds such as Akita and Shiba Inu. DLA comparisons are always extremely interesting as it can inform on origins of breeds; breeds that have more DLA association indicate evolutionary development of breeds, as opposed to those with less DLA haplotypes in common. It will be interesting to see how breeds like the Portuguese Water Dogs look in comparison to similar breeds, like the Barbet. It is not possible based on 49 individual dogs to make final conclusions, but the results of initial testing do provide important insights. The 49 dogs selected for testing appear to exhibit surprisingly more heterozygosity than expected. Assuming these dogs are representative of the breed as it currently exists, it appears that breeders have done an excellent job of finding and using the least related parents from within the existing pool of breeders. Although the initial 49 dogs that were tested were heterogeneous (i.e., not inbred), the breed appears to have below average genetic diversity. The breed has retained an estimated 22% of the genetic diversity known to exist in village dogs from the ancestral area of the breed founders. A lack of genetic diversity was also seen with the low percentages of known canine DLA class I (6%) and class II (10%) haplotypes that were represented in the Barbet that were tested. More biodiversity may be discovered as more dogs are tested. Samples are needed from countries such as Finland, Switzerland, Canada, US, Sweden, Germany, Poland and the Netherlands. 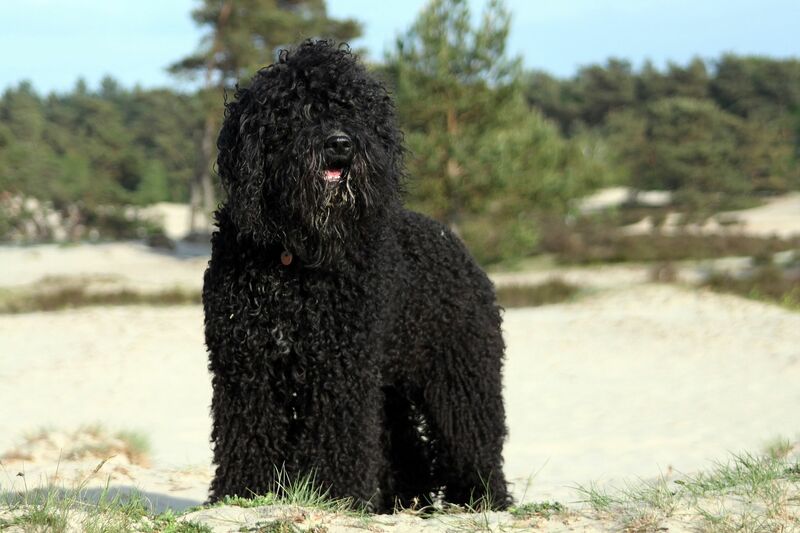 Since the Barbet is a relatively healthy breed, randomly breeding with its diversity relatively well distributed, we recommend breeders test their dogs and continue this trend! Breed for IR at or below zero and OI at or above breed average. When all else is equal, take note of atypical DLA haplotypes and make an effort to redistribute those that are poorly represented. More samples are needed from this breed to establish a full breed report. If you have a Barbet and would like to contribute to the research phase, you can do so here. Did you test your Barbet in the initial research phase? Create an account here and Submit your dog here. You can also start using our breed management software with your free trial today. Use coupon code Barbet19 (*offer only for Barbet breeders). Take our mini course here!